Everyone wants to get their hands on stacks of gold and while this online pokie from Aristocrat may have a name that suggests riches, it’s a fairly run of the mill game that offers up free spins and multipliers but not a lot else. However, lots of people enjoy pokies that are easy to play and like to focus on spinning up some wins rather than triggering bonus rounds, so Stack of Gold could be just what they are looking for. With gold bars, nuggets, coins and ingots sitting next to playing card symbols across the 5 reels, it’s a nice and shiny poker machine which has enough golden opportunities to maintain interest even for people who prefer multi-round games. A fairly simple design greets players, with a subtle golden backdrop to blue-tinted reels and a gold braid machining up a framework around them. One of the first things that players are likely to notice is that instead of paylines, the game has Xtra Reel Power, which is a fancy way of saying that symbols pay on adjacent reels running from the left side and it doesn’t matter where on each reel they land. With 4 rows of symbols, that equates to 1024 ways to win across all of them, although the scatter symbol can appear in any 2 or more places to be worth a prize. Below the reels is a control panel where players set their bets from 0.01 for each of the 40 coins upwards, while they can also set the reels spinning for a defined number of times without having to click a button for each spin. There’s detailed information available about how the bonus features work and what each symbol is valued at, starting with the classic playing card 9, 10, J, Q, K and A icons. These are standard symbols that appear across many pokies and players will instinctively know which are the least valuable and which are the most. Although the 9 pays out less than others, as a consolation only 2 of them need to be on the first reels to pay out 2x the bet per reel, while a full line of 5 will be worth 100x. Other playing card symbols need to be on 3 reels to pay anything, with the K and A having values of between 10x and 140x. The various images of lovely gold make up the more rewarding end of the paytable, with each only needing to appear on reels 1 and 2 to make up a winning combination. Landing the bars of gold will pay the most, with 50x, 200x, 250x and 300x the bet per reel when 2, 3, 4 or 5 stop on adjacent ones. A couple of basic bonus symbols trigger the extra features and while they may be fairly straightforward, the extras can be quite easy to trigger and should add some decent winnings to a player’s balance. 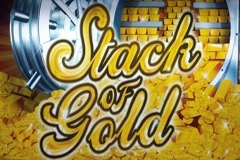 The Stack of Gold logo is a wild symbol, meaning that it can replace others to help make up winning lines, although it only appears on the middle 3 reels and won’t be worth anything on its own. It won’t act as the scatter either, but can still be a valuable symbol to land. The scatter is the door to a bank vault and when 3 appear anywhere on the reels, players win 2x their total stake per spin, while 4 or 5 will be worth 10x or 20x respectively. Once the scatter pays have been awarded, players enter the main bonus feature which is a free spins round, with 8, 15 or 20 spins playing out, depending on how many scatters triggered them. During the free games, wild substitutions will be multiplied by a random 2x or 3x, while having 2 scatters appear at once adds a further 5 free spins and 3 or more scatters re-triggers the round, with the new games following on from any still to play in the current round. Stack of Gold will have a pretty broad appeal for those players who like uncomplicated games. Bold colours and sharp graphics add a bit of interest, although maybe Aristocrat could have done a bit more to make the playing card symbols a more interesting rather than using completely standard ones. It would also be nice to have wild symbols appearing on all reels, but it’s not a big issue and apart from this, Stack of Gold is a decent enough pokie machine for those who like the format.